Kitchen! Kitchen! : home made hummus ....at kitchen! kitchen! 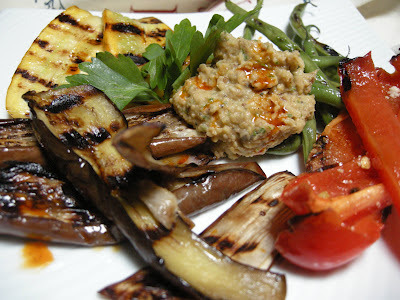 A delicious lunch of grilled vegetables with home made hummus. It's just screaming with pure delight! You may add any grilled meat to this dish. Combine all of the ingredients in a food processor and pulse to desired consistency. I love my Hummus with some bits of the eggplants and chickpeas - not pureed. Delicious served with grilled vegetables, as a dip, or with any roasted meat.